Our aquarists help to care for all of our creatures. They maintain the living environments to ensure the creatures are comfortable and safe as they would be in their natural habitat. The aquarists also prep food and play with the creatures with hands-on interaction. You can see a weekly series of what they get up to on Facebook – make sure you tuna in. 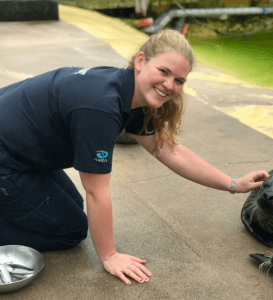 Kate has worked with us for three years and loves working with our harbour seals. She’s been working in aquariums for the past 11 years and enjoys coming up with new enrichment ideas to keep the animals active. Enrichment keeps our creatures stimulated physically and mentally, so that they stay active and enjoy their life below the waves. Why did you become an aquarist? I never actually realised being an aquarist was a job, so it wasn’t something I knew I wanted to be when I was a child. I always knew I wanted to work with animals. I love animals and this is the perfect job for that. I first started working in an aquarium when I was 13 and it was from there that I found a love for working with marine life and aquatic animals. How did you train to become an aquarist? I didn’t go through any specific training to be an aquarist. Before I went to university, I worked in an aquarium at the weekends and during summer. This gave me so much experience in knowing how aquariums work, handling creatures, prepping food, and understanding the general ins-and-outs of working with marine life. I went to university to study zoology and conservation, which just validated my love for animals and marine biology even more. After graduating I was lucky enough to get the job here. So, for me there was no real training route I went down. I followed my love for animals through work experience, my degree, and landed my dream job as an aquarist. What is your favourite part of being an aquarist? Working with the animals: that’s definitely my favourite part! There’s never a dull moment as an aquarist. Even though I have a routine that I follow, every day is different because the creatures can be so unpredictable and they all have such great personalities. Are there any challenges being an aquarist? Keeping dry! Working in an aquarium and working with water, it’s so hard to keep dry. Especially your feet. It’s become like a daily challenge to see who can keep the driest on shift. Do you have a favourite animal? I love all of the creatures at Deep Sea World, but I do have a soft spot for Cody. Cody is one of the harbour seals. He’s so cheeky and fun to work with that he probably wins as a favourite for me. Do you have any questions for Kate or want to know more about being an aquarist? Let us know on Facebook and Twitter. You can always pop by and meet one of our aquarists in person, too.